The summer of 1986 brought a fleet of used, but specialized, railroad passenger cars on the market. 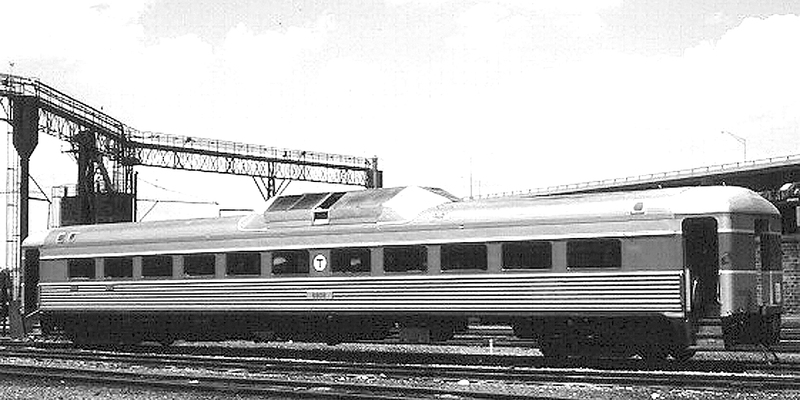 Some time earlier, the Massachusetts Bay Transit Authority (MBTA) had taken over the rail commuter services north of Boston from the Boston & Maine Railroad (B&M), and in so doing, inherited a large number of Rail Diesel Car (RDC) units they promptly put up for sale. Seeing the opportunity to acquire a unique piece of equipment for the NHVRy, Melvin Best, one of our members, went to Boston, and arranged to purchase an RDC9 for just $500 of his own money as a donation to the museum. Almost immediately the plan began to unravel into a multi-year odyssey, taking the purchase on a grand tour of the country with a bit of international travel included for a bit more interest. The term RDC is an acronym for the words Rail Diesel Car, given because all such units were equipped with at least one diesel engine slung in a housing beneath the car, making them self-propelled. This was an advantage in commuter services and on lightly traveled branch lines since trains could be run without locomotives and not need to be turned at each end of the trip. An RDC9 was unique among the various types of RDC built by the Budd Company, and a type built only for the B&M exclusively. It is all-passenger like the RDC1, but it possess no engineer controls or cab. It was designed to be used as a trailer in conjunction with other types of RDC. These particular units, however, were now well past their prime, and had been replaced with newer equipment. The trip began in Boston when our RDC was switched from the MBTA over to the main Conrail freight yard, and coupled to an EMD F-Unit destined to be refurbished at the Montreal Locomotive Works plant in Quebec. This odd pairing was then put into the consist of a Conrail freight train bound for Selkirk Yard just outside of Albany, N.Y. The train made a number of stops, including one for the F-Unit to be set off for interchange to the Central Vermont Railway for its trip to Montreal. However, someone neglected to properly read the waybills, and our RDC remained coupled to the F-Unit all the way to Montreal, and into the Montreal Locomotive Works (MLW) plant. About three days later the folks at MLW telephoned the folks at Conrail to inquire as to what they should do with the RDC since no work order had been filed on it. That engendered a day of searching through Conrail records to locate the waybill of an RDC the folks at Conrail had assumed to have been delivered to Selkirk Yard some days earlier. A few days later our RDC arrived at Selkirk where it was assumed it would be routed down the River Line into Weehawken, N.J. to continue its journey south. Unfortunately, that is not what happened. The RDC was placed on a classification track in the huge complex of Selkirk Yard, but then Conrail lost the RDC! 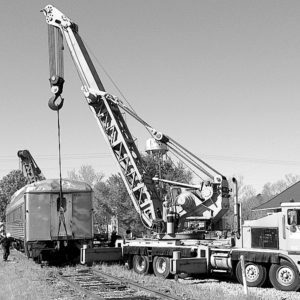 It had disappeared into the confusing mass of mishandled and misclassified cars overflowing from Selkirk Yard at that period in the history of the collection of inefficiencies we once called Conrail. The situation conspired to leave our RDC forlorn and lonely in the bowels of Selkirk Yard for almost a full YEAR! Hardly a week went by without a telephone call or letter going from us to some employee or official of the Consolidated Railroad Corporation, pleading, cajoling, and/or even threatening in a vain attempt to convince someone in the company to locate the car. Our words fell upon deaf ears, or were simply ignored. At long last we had a telephone call from the Yardmaster at Selkirk. The next day the sky above the yard was filled with the pounding beat of a helicopter! It circled taking photos. 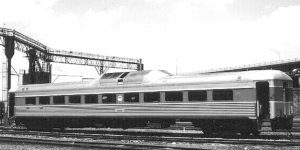 When the photos were examined a few days later, the shape of a long, silver passenger car was clearly visible in one of them. Now there was another problem. After having been essentially “in storage” for so long, FRA rules demanded the brakes on the RDC had to be inspected, certified, and certain parts replaced, needed or not. The second part the problem was the fact the shops at Selkirk were overloaded with work, and could not undertake to do our RDC. The solution was to send the unit to the shops in Buffalo, N.Y. instead. A day or two later our RDC was given a temporary certificate for movement, and was on its way west through the Mohawk River Valley for its date in Buffalo. The RDC arrived there at some point, and left there just a few days later, but no one has ever been completely clear as to why the shops at Buffalo did not service the brakes, and further, why the unit was placed into the consist of a westbound freight for departure to Chicago. The folks in Chicago began to get things right. Since Chicago was about as far west as one could go on Conrail. A set of new waybills were cut for a new routing, and the wandering car began making its way east. This time it was bound for Enola Yard near Harrisburg, P.A. 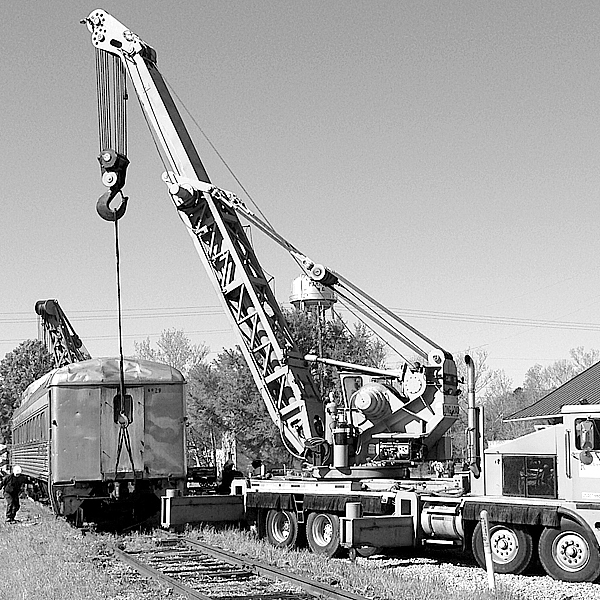 Within hours of arrival at Enola the RDC was routed on the tracks of the former Reading Railroad further south to Hagerstown, M.D., switched onto an interchange track, and placed into the benevolent hands of the Norfolk Southern. The NS nearly had a case of corporate apoplexy. Ever since departure from Selkirk Yard just over a month earlier, the unit had been moved under a “temporary” brake inspection certificate, and that had now expired. The shops at Shenandoah Junction were deemed too far away for the car to be moved even that far, so the work was done at Hagerstown. Now the NS wanted to be paid for the work, and wanted to be paid before the car moved another mile on their lines. 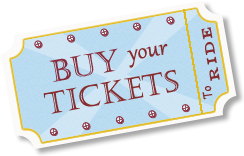 The bill came to $3,800, payable on demand, and they were demanding. There was nothing else to do but settle the account as quickly as possible, and the unit was on its way to North Carolina at last! NS routed the car from Hagerstown on as direct a route as possible, but not actually to Raleigh quite yet. This time our RDC was given some time to repose at the seaside, and next found itself on a siding owned by the Beaufort & Moorehead Railroad at Morehead City, N.C. There is something mildly surreal in the fact an RDC originally owned by the Boston & Maine (B&M) would also get to roll on the tracks of the Beaufort & Morehead (B&M), thus being able to claim some allegiance to both railroads having the symbol B&M associated with them. After a short time in Morehead City, our RDC was moved to Beaufort by the B&M where it remained until 1990 when the B&M was sold and the suggestion was made we find other accommodations for our car. Unfortunately, we did not have the facilities (or cash) to bring it to Bonsal. 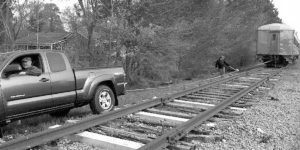 Calls were made to as many companies, organizations and individuals with access to railroad sidings or spurs as we could locate in an attempt to find a home for our RDC as quickly as possible, and a benefactor came forward. The North Carolina Transportation Museum at Spencer Shops was able to accept the car on loan for a time with the stipulation it could be used as a coach on their train ride as needed. We agreed, and the car was off on another trip, this time halfway across the state to the museum where it did see duty as a coach occasionally. Then in 1997 the collection of equipment at Spencer had grown to a point where more room was needed. After almost seven years at Spencer Shops, and eleven years after we had acquired it, our RDC was being evicted again, and still another home for it had to be found. Eventually, we found a friend of a friend who had a warehouse with a railroad spur and enough unused room at the end of the spur to hold our RDC, so permission was obtained to store the car in the old A&P Warehouse in Raleigh. The good news was the spur was indoors! The spur connected to CSX near Glenwood Yard, and ended inside the warehouse. The prospect seemed ideal, so the car made its way from Spencer to Raleigh, was switched into the warehouse, and was shut away behind closed doors to await the next move, whenever that would come. Our much traveled RDC9 reposed quietly behind those doors for another seven years. 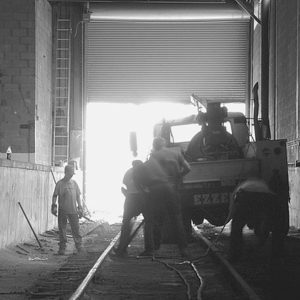 Then in early 2004 the warehouse came up for sale, and the new owner determined the space inside was too valuable to be “wasted” on the free storage of “defunct railroad cars.” Another eviction was ordered, and a new location had to be found. In April of 2004 the NHV’s own BType tractor was transported to the warehouse, and using chains, pulled the unit across the street where the car was secured once again. 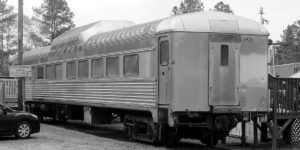 A few years later, the Red Springs & Northern (RS&N) suggested they would like to use the RDC on the excursion trains they hoped to operate, and offered it another home. Soon enough, waybills were cut, and the CSX pulled it from the siding in Raleigh for a journey to Parkton, N.C. However, whatever hex hovers over this unit struck still again! The siding at the RS&N at Parkton is a facing point siding, so instead of setting it out, the CSX crew took it all the way to Hamlet. Then somehow it was decided the brakes had to be done again, so the RDC was routed all the way to Jacksonville, FL, and then back to Parkton. Earlier this year we determined to bring it to Bonsal but by truck this time to prevent another disappearance. After twenty-eight years and a journey of thousands of miles, the RDC9 now reposes on the NHVRy waiting for restoration.